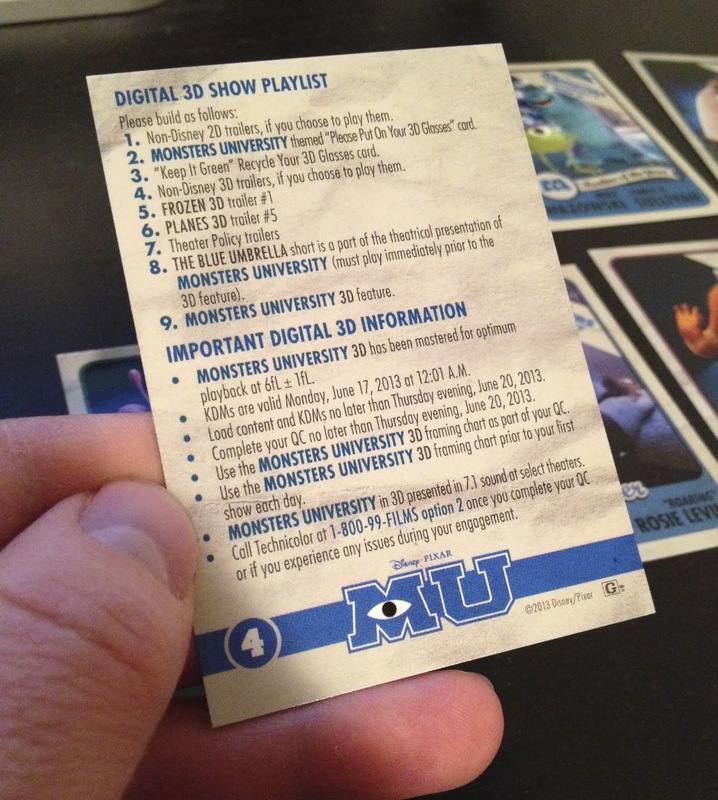 As SOON as I saw Monsters University back at the college advanced screening in April, one of the first things I thought of was "Man, I hope they release those scare cards to collect. That would be awesome!" While this isn't an officially released set of movie accurate scare cards, it comes pretty close. 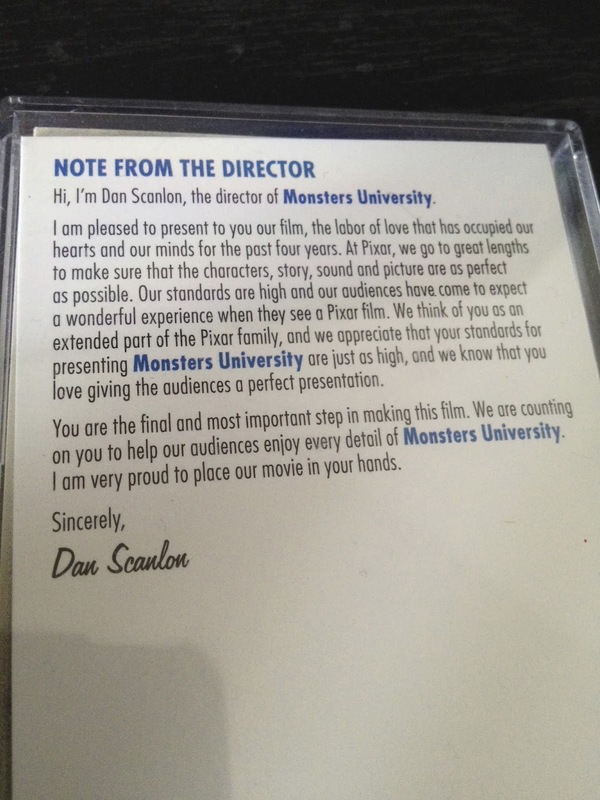 These cards were only given to movie theater projectionists. 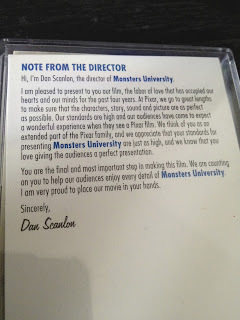 It was a very creative way for Dan Scanlon and his crew to get the digital projection instructions to the projectionists so that they could present the movie in the highest possible quality. They are extremely rare since, to get them, you either had to be a theater projectionist, know a theater projectionist or know someone who knows a theater projectionist (like me). First of all, this set of cards comes in a plastic, protective case (which I thought that was really cool since I consider it a collector's item). 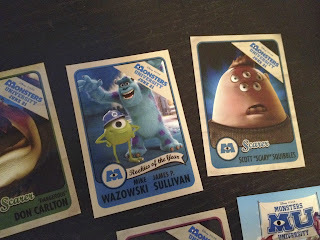 Again, as you can see, these cards aren't exactly 100% movie accurate. The banner across the the upper right corner on each card says the film's title and release date rather than the scare company. Also, the backs of the cards (like mentioned) have projectionist instructions on them rather than the monsters' stats. Either way though, I'm still super excited to have these. A HUGE thanks to my good friend Brian Hughes for sending me this set of scare cards for Christmas! The only official (film accurate) Scare Cards ever released so far were available as exclusives at the Disney Parks and at the Disney Store- both for a very brief time. 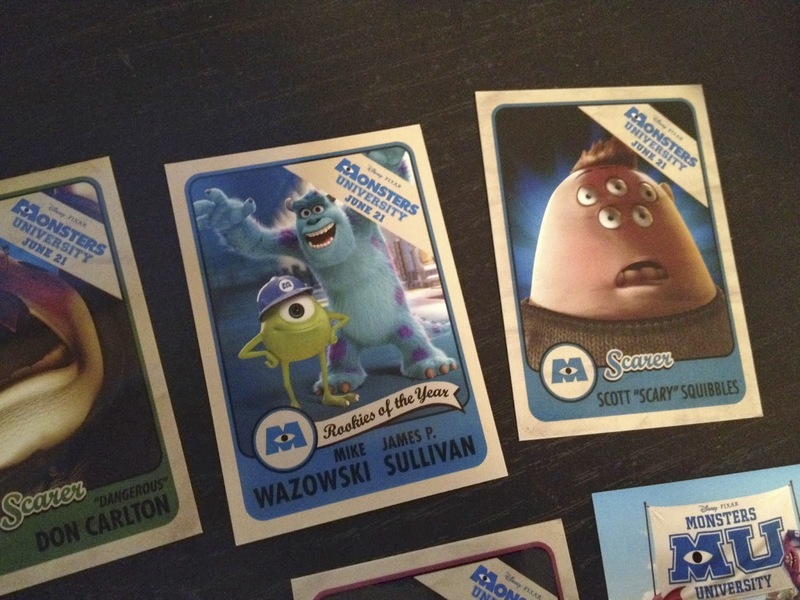 Tracey, Stacey and Casey Kowalski "Kowalski Sisters"
"Rookies of the Year" card featuring Mike Wazowski and James P. Sullivan. 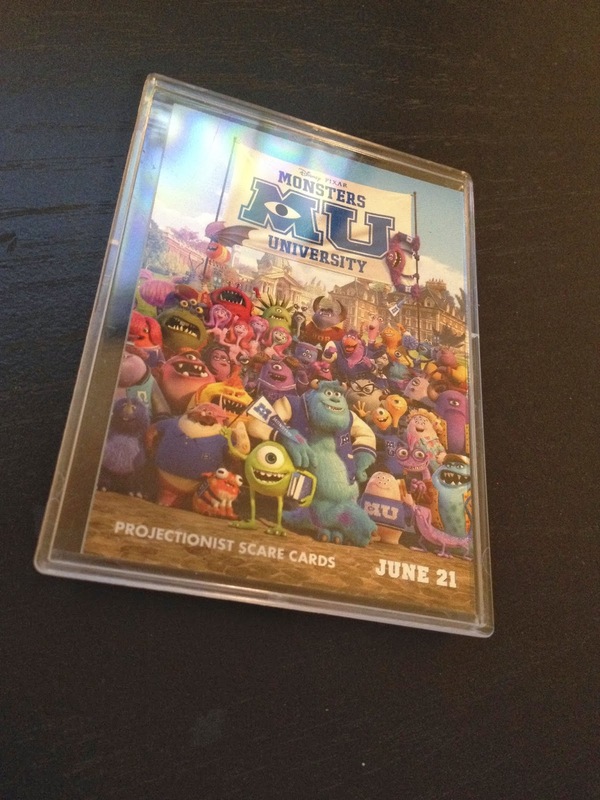 So, total between the "Monstrous Summer Event" packs and the Disney Store packs, there were 34 "official" (movie accurate) scare cards released. 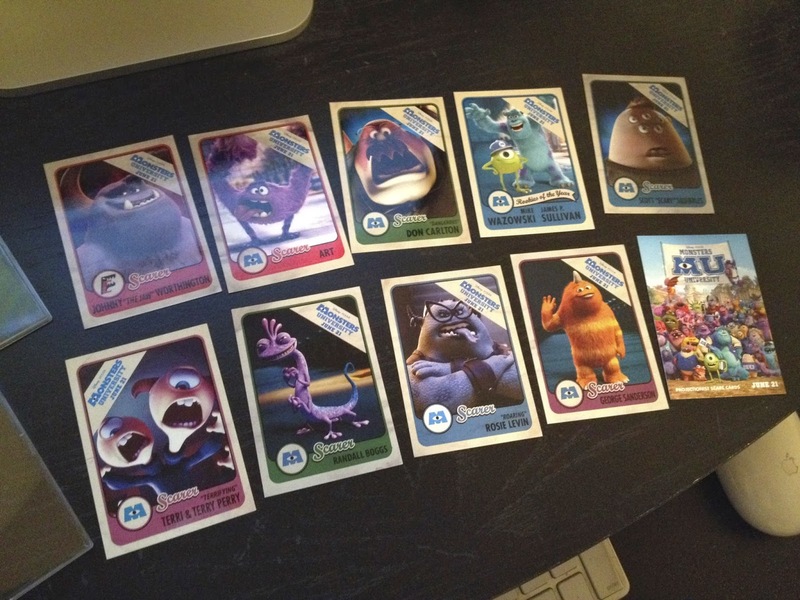 All 34 cards can be seen together in the eBay image below (image not my own). Note: Within the official 34 scare cards, there is however, NO Johnny Worthington OR Rosie Levin...those characters' scare cards are only found in the projectionist set like the one I have. 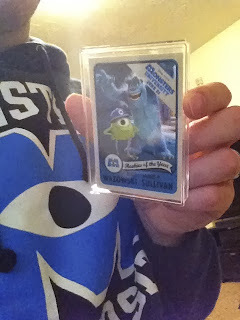 I really hope Pixar releases mainstream scare card packs to buy at the store...there's so many they could make! 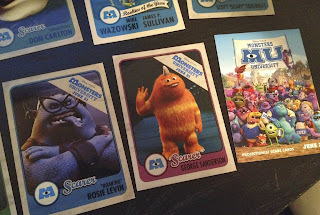 But until then, I'm very happy with my set of projectionist cards. 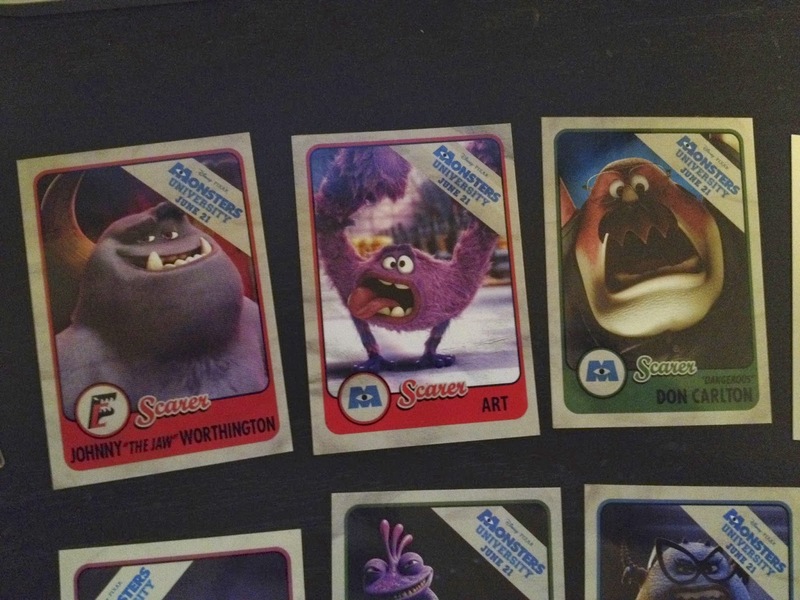 UPDATE - More scare cards have been released; this time as "tear outs" in a Monsters University coloring book that was released in July 2014. They're not the same quality as the "official" ones talked about/seen above, but come pretty close. In addition, one new character card was released with the book that wasn't available in the Disney Parks/Store selection - Carol Dallmar! Read my full write up on this coloring book and included scare cards right HERE. Absolutely! Brian is the man. 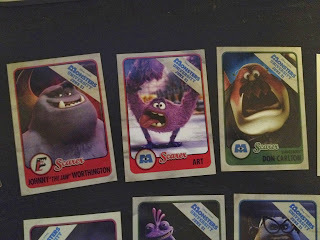 I have some amazing Pixar fans looking out for me : ) Still waiting patiently (as Dan Scanlon said) for the wide release-really hope they're actually coming!! 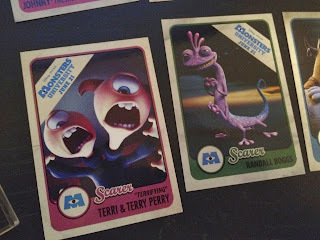 do you still have these cards? Do you have Rosie Levin? How much are you asking? What about Johnny? Yes, I have Rosie and Johnny as seen in my pictures, however nothing from my personal collection is for sale. Sorry about that! Do you know where they can be purchased? My son loves them. 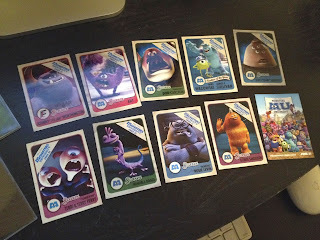 I can't find those cards and already wrote to Disney. These cards were only given to movie theater projectionists and are extremely rare. I got them from a friend. The only place would be eBay but I just checked and there are no current listings for them. Keep checking though and they might pop up on there! Good luck on the hunt, I really hope you find them. I made one. lol He's only two, turning three...I'm lucky.